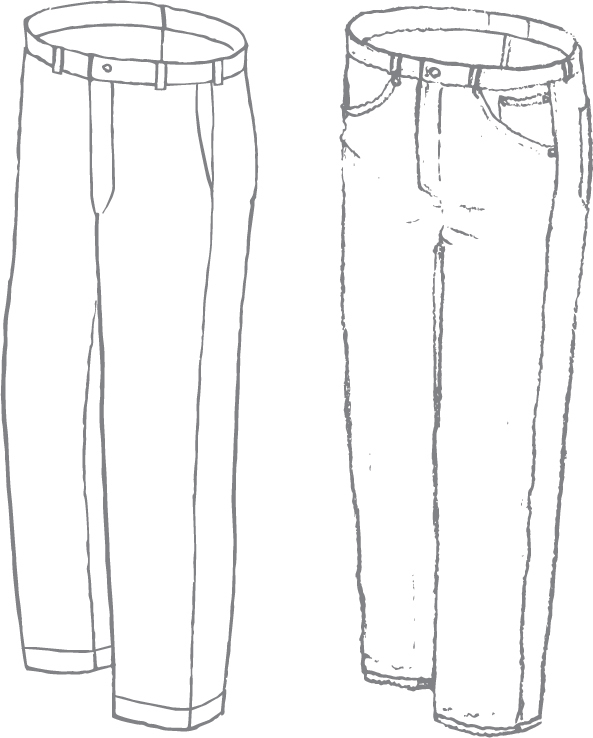 2) jeans in denim and non-denim (jean-cut pants that ride on your hips, or slightly above). Today, manycasual pants can be worn in a dressy way if the fabric is more refined. Medium or heavy twill depending on season. Start with a tan neutral and add olive and navy after that. Spice it up with shades of red – and we love white in the summer. Corduroy adds variety in both pattern (vertical) and formality (some perceive less and some perceive more formal). The season in our climate is middle August to middle June. Start with the traditional caramel color and add an earth tone – and then blue or navy. Denim jeans should be in an 8 to 12 oz. denim depending on season. A 9.5 oz. is comfortable most of the year in our climate. The most important wash is the dark, which can be worn dressy and casual. Even pair them with a sports jacket. After that, the sky is the limit in both washes and fit. Our favorite fit is trim but not tight, usually referred to as a straight cut. After denim, we suggest a cotton twill in a neutral shade. There are also corduroy options – and in the fall, we usually do a wool flannel or wool twill in grey. Make sure the rise is comfortable since there is not a proper alteration if it is not. The crotch of the pant wants to be close but not tight. A rise that is too long decreases the mobility (stride) and makes the pants look too big. The hem can be finished plain or cuffed (except jeans) and should touch the shoe but hardly break (current fashion). And one seasonal favorite, LINEN. Enjoy its wrinkled texture, and wear it in style.